Merchantman was a late frigate of 1018 tons. She was three-masted with an oak hull with specifications: length 175 ft., breadth 34 ft., depth 22 ft. with a draft of 17 ft. 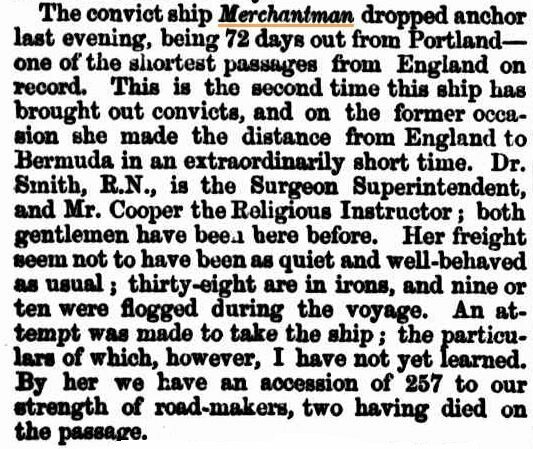 This was the second voyage Merchantman had made to Western Australia with a consignment of convicts. 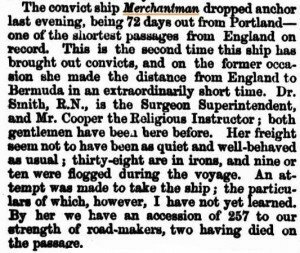 Merchantman left Portland on July 1, 1864 bound for the Swan River Colony and arrived in Fremantle on September 12, 1864 after a passage of 73 days. Two of the 260 convicts who had embarked died on the voyage. Ten of the total number had seen Army service and had been court martialled for various offences. 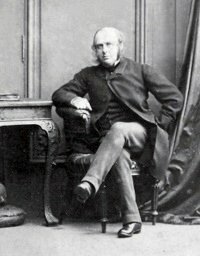 At least one of them, Patrick Cahill, had allegedly served in the Crimean War in the 50th (Queen’s Own) Regiment. He had been convicted by court martial at Colombo in September 1862 for firing at a sergeant and was sentenced to life transportation. 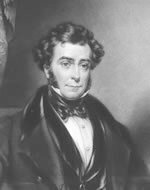 Captain William Gardiner and Dr William Smith were the captain and surgeon respectively; the religious instructor, Mr C. Cooper. Also on board were 28 men of the enrolled pensioner force, their 18 wives and 40 children. Six warders were on board, some with families. Ten of the enrolled pensioner force were Crimean War veterans, all former infantrymen who had discharged to pension. 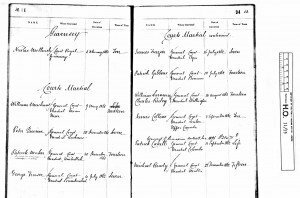 One of the warders, John Wilcox had been born in Sydney, Australia when his father, in the 80th Regiment was stationed there. After serving with the 3rd Battalion, Grenadier Guards at Sevastopol in the Crimean War, Wilcox discharged from the Army and was employed in WA as a warder for less than 12 months. He then returned to England, rejoined his old regiment, finally discharging 12 years later. A number of free settlers were also on the voyage. There was disturbance on this voyage when a number of prisoners broke into the storeroom and misappropriated beer, cheese and other provisions; they were flogged and put in irons for their trouble. Dr William Smith’s surgeon’s journal for the voyage is preserved in the National Archives, Kew. Researchers can view a copy on the Australian Joint Copying Project (AJCP) microfilm reel 3181 which is held in most major libraries and archives throughout Australia. It can also be accessed by subscription on the ancestry.co.uk website. 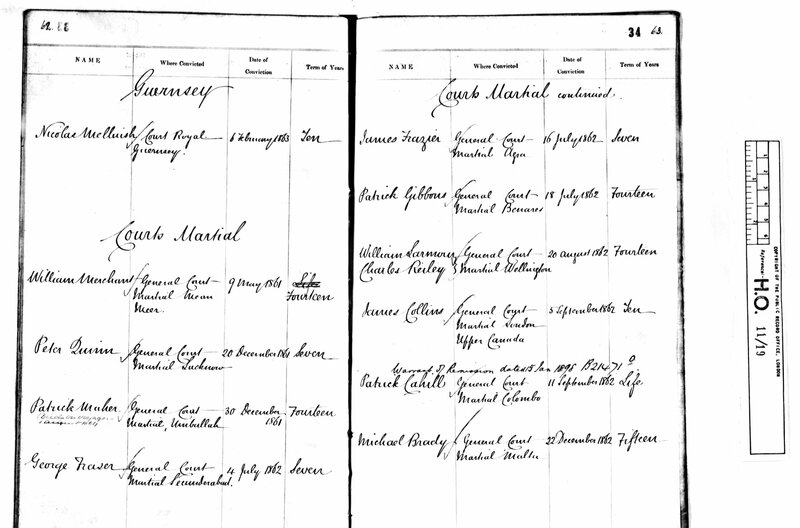 Convict Transportation Register HO11-19-34, National Archives, Kew. West Australian Times 15 Sep 1864, TROVE, National Library of Australia.